Recipe for ellu urundai. 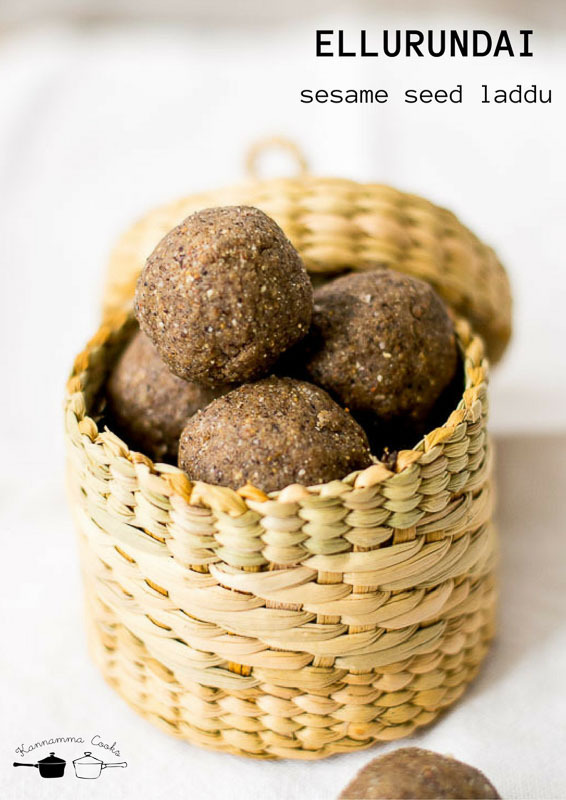 Sesame laddu made with black sesame seeds, roasted peanuts and jaggery. Very special sweet in the kongunadu region. Sesame is an important seed used in Tamilnadu cuisine. Sesame and its oil is very traditional in this part of the world. Sesame is called as எள் (Ell) in tamil. Sesame oil was referred in olden days as எள்நெய் (Ell Nei). Ell meant sesame and Nei meant fat. Later on the name எள்நெய் (Ell-Nei) became எண்ணெய் (Enn-Nei). So the name எண்ணெய் Enn-Nei was referred only for sesame oil in the olden days. When other kinds of oil started appearing, the term எண்ணெய் (Enn-Nei) became a generic word for oil. Sesame oil became நல்லெண்ணெய் (Nalla-Enn-Nei). Nalla means “good”. The nutritional benefits of sesame is astonishing. 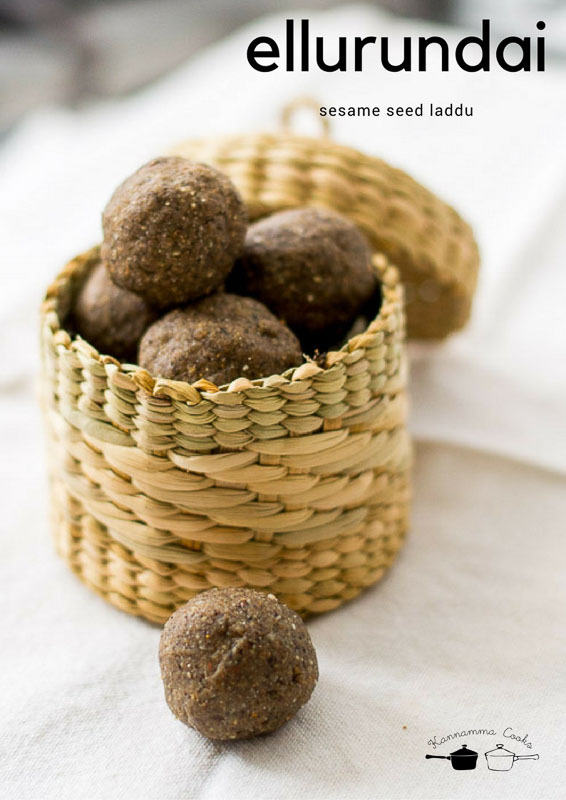 Ellu Urundai is a kongunadu special sweet made with sesame as its main ingredient. Its really healthy and has very minimal ingredients. The traditional method is made using ural ulakkai (wooden mortar-pestle used for pounding grains). I have made the ellu urundai in a mixie today. 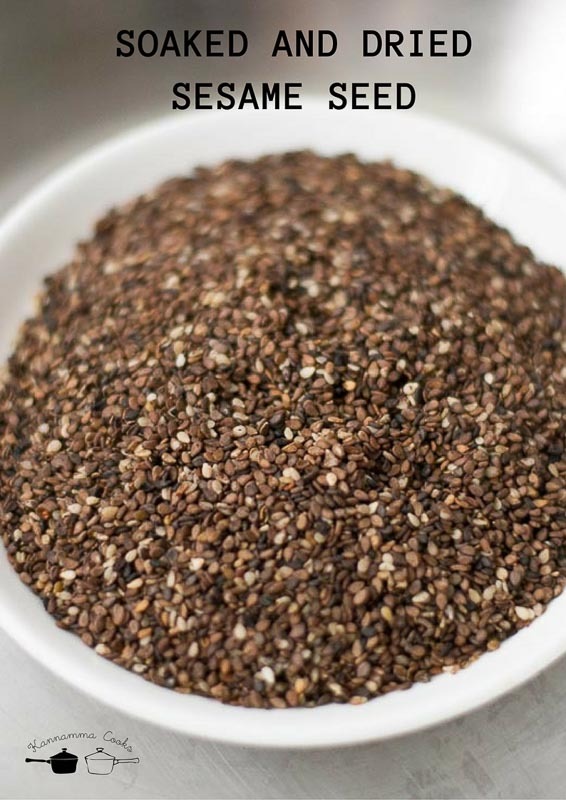 Ellu urundai is extremely nutritious as sesame contains several B vitamins, iron, magnesium, calcium, phosphorus, and zinc. Many articles also suggest that sesame consumption may help in small reductions in both systolic and diastolic blood pressure. 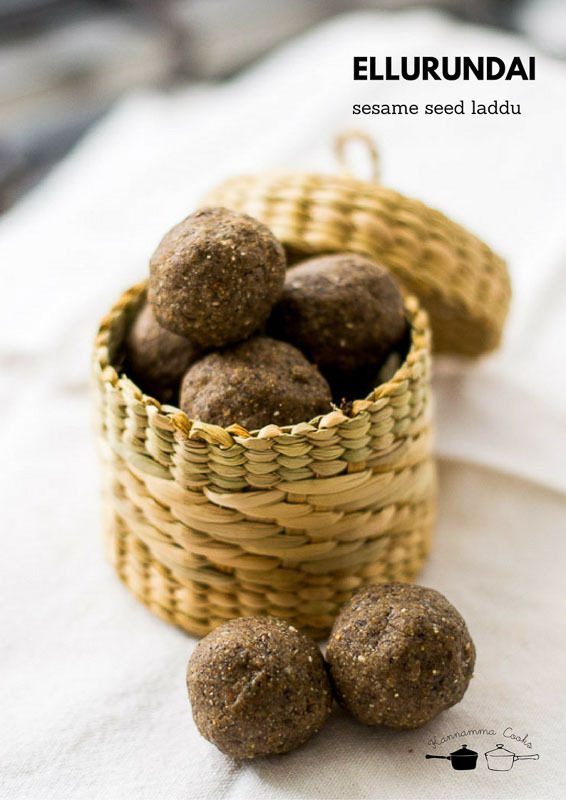 The recipe for ellu urundai is very simple. The main ingredients are soaked and dried black sesame seeds, roasted peanuts and jaggery. A little bit of roasted coconut is added along to make ellu urundai. Here is how to do Ellu Urundai! Soak the black sesame seeds in water overnite. After the long soak, rub the seeds pressing them in the palm. Some of the husk from the seeds will come off. Strain the water. 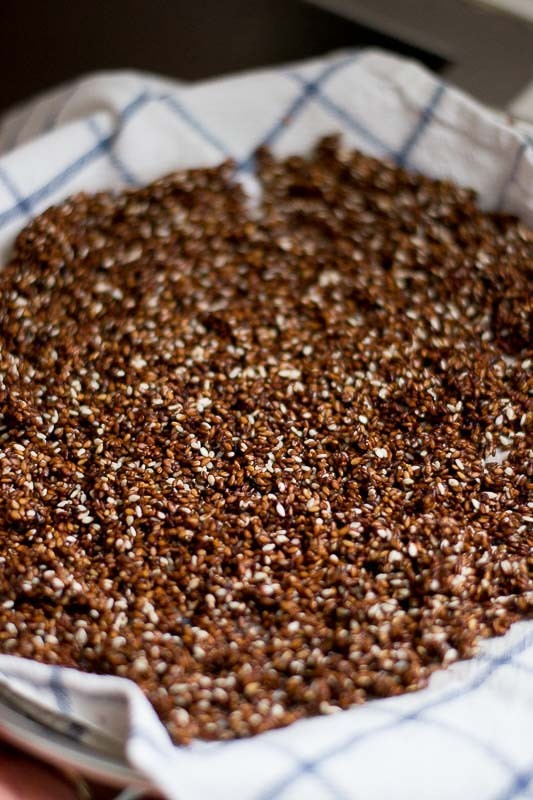 Spread the strained and wet sesame seed on a cotton cloth and allow it to dry completely under the sun. If there is not much of sunshine in a place where you live, try changing the cloth after 30 minutes and let it dry under the fan or shade. The dried sesame seeds can be stored in the freezer for upto 6 months and used accordingly. 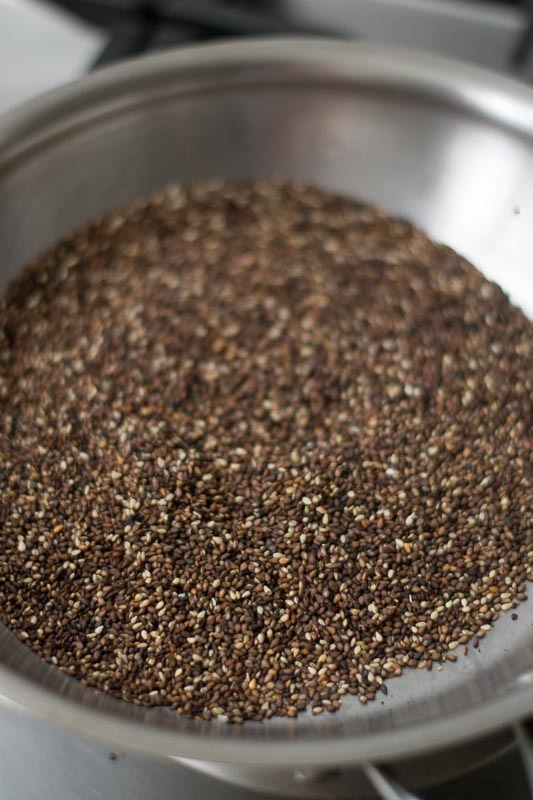 Storing the sesame seed in the freezer will help the seeds from becoming rancid fast. It stays fresh in the freezer. Dry roast the soaked and dried sesame seed in a heavy pan on a LOW FLAME until it starts to pop here and there. The sesame seeds will start to burst. Once it starts to burst, the roasting is done. Set aside on a plate. In the same pan, dry roast peanuts. Roast until the outer skin is dark here and there. Remove from the pan and let it slightly cool. Remove the husk and set aside. Dry roast the coconut for a minute. Set aside. When the ingredients are still warm, we will grind everything to a powder. The warmth makes the jaggery bind well and it will be easier to make balls / laddus later on. Take a mixie jar and add in the powdered jaggery, roasted sesame, roasted peanuts and roasted coconut. Pulse several times in a mixie, until its a very very slightly coarse powder. Remove the powder to a bowl. Make small balls / laddus from the mixture immediately. Its easier to make balls when the mixture is still warm. 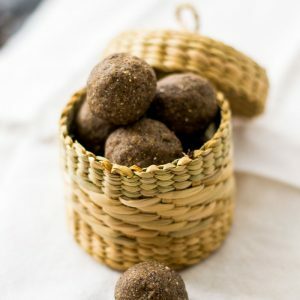 We like to make small balls that are bite size. Tip: If the balls are not forming, add a teaspoon of very hot water, mix well and try to make balls. 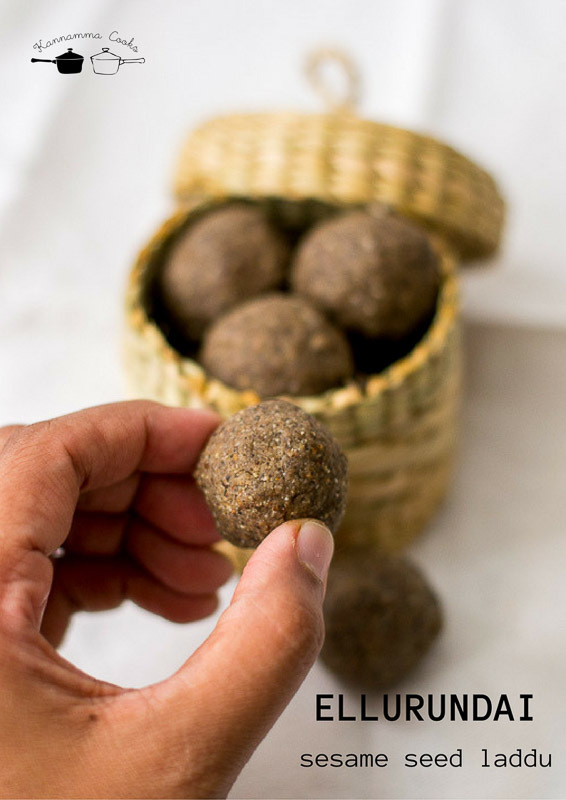 Ellu urundai can be stored at room temperature for upto 3-4 days in an air tight container. Soak the sesame seeds in water overnite. Clean and drain the seeds, dry in sunlight. Dry roast the sesame seeds until the seeds starts to burst. Set aside. Dry roast the peanuts and remove the husk. Set aside. 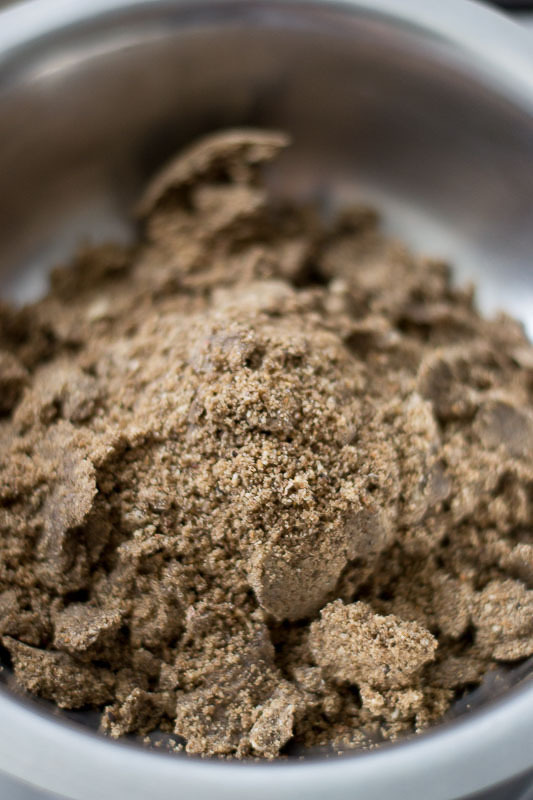 When the ingredients are still warm, grind everything to a powder along with jaggery. Make small balls / laddus from the mixture immediately. Hi…. Is Coconut compulsory….? I did the receipe without using coconut … So that we can preserve it for a week …. Sure Anita. You can skip if you don’t want to use. Can we make this with white sesame seeds? Do we need to soak that too? I am raj from udumalpet, tried your ellu urundai. Really excellent tasty and nutritional dish madam. Ok thank you ..love your recipes and thanks for ur accurate measurements..
Why do we need to soak ellu overnight? Can we dry roast ellu and try the same procedure? If you just dry roast, the ground ellu will be pitch black and slightly bitter.